An international team of researchers attempted to breathe life into the ancient cells in a similar fashion to what film fans have seen in the 1993 blockbuster Jurassic Park. The research, carried out at Japan’s Kindai University, saw the five cells sparking a biological reaction after being transplanted into the mouse’s embryo. However, despite the hopes and dreams of those wishing science will eventually be able to bring back to life extinct animals, the process necessary to clone a living being, the cell division, didn’t occur. The researchers involved in the study are positive further progress in the field can be made. Kei Miyamoto of Kindai University told AFP: “This suggests that, despite the years that have passed, cell activity can still happen and parts of it can be recreated. But other experts in the field are quashing hopes a mammoth as we know it will ever be cloned. 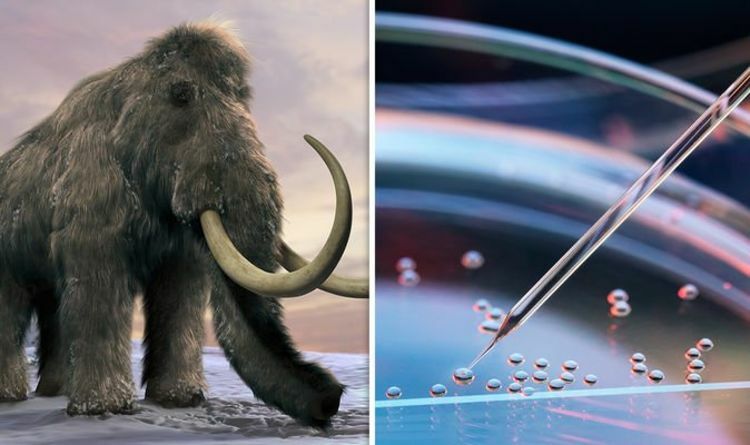 Evolutionary molecular biologist Dr Beth Shapiro told Daily Star Online: “It depends on what you are willing to accept as a mammoth. “If you want something that is 100 percent identical behavioural and genetically and physiologically to an organism that used to be alive, and the answer is never. This will never happen. “The environments have changed in which the animal would grow up. The animal would gestate in the egg or the womb of a different species. “They would be raised by a different species. “Even if we manage to make something that is 100 percent genetically identical to an extinct species, which we can’t do, everything is more than the sequence of DNA. However, Dr Shapiro conceded it may be possible in the future to have a different and more modern version of a mammoth recreated with the help of science. “However, the technology is still a very far way off – we need to transform an edited elephant cell into an actual living breathing elephant that is part mammoth.